In 1971, Ireland decimalised its currency in parallel with the UK. We did this because we were tied to the UK Pound at that time and one of the more unusual mathematical aspects of decimalisation was that both countries set the conversion rate for the new penny at 2 or 3 old pennies. One new (decimal) pound was worth 240 old pennies but, if one had the patience, and handed them in two at a time, one got 1p back, therefore 240 old pennies could have got 120 new pence back – an instant profit of 20% ! I’m someone did this over and over until they got fed up. Another unusual aspect of the Irish decimal penny is that the Central bank changed the alloy from bronze to copper-plated steel in 1990. This happened because the cost of producing bronze pennies exceeded their face value. In time, allowing for price inflation of steel + the cost of copper-plating the planchets, the second type also cost more to produce than the face value of the coin. As one can see from the mintage figures below, none of the decimal pennies are scarce, although a premium is always paid for coins in the highest grades. Due to the retail industry’s insistence that they price their goods at 1p below the nearest pound, there was a constant demand for pennies for change and the Central bank had to produce huge numbers to keep up with this demand. In order to keep a collection ‘interesting’, many collectors seek out errors on the 1p coins, e.g. 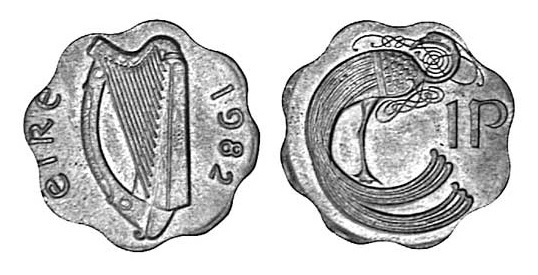 1982 IRELAND, one penny, struck on a scalloped edge brass blank of type for use in Philippines for their five centimos coins. I am not sure whether the Central Bank of Ireland was minting coins for the Philippine government in 1982, or vice versa. Either way, this is a spectacular error with great ‘eye appeal’. Also in 1982 – an unusual 1p on ½p Planchet ERROR. Once again, this is an unusual error and it is rarely seen. It would appear that 1982 was a ‘difficult’ year for quality control at the Central Bank of Ireland. unusual 1p on ½p Planchet error is worth approximately how much? If its in uncirculated condition without any disfiguring planchet flaws, I’d price it at €120 – the price rapidly depreciates if its worn or damaged. can I email the photos of mine? 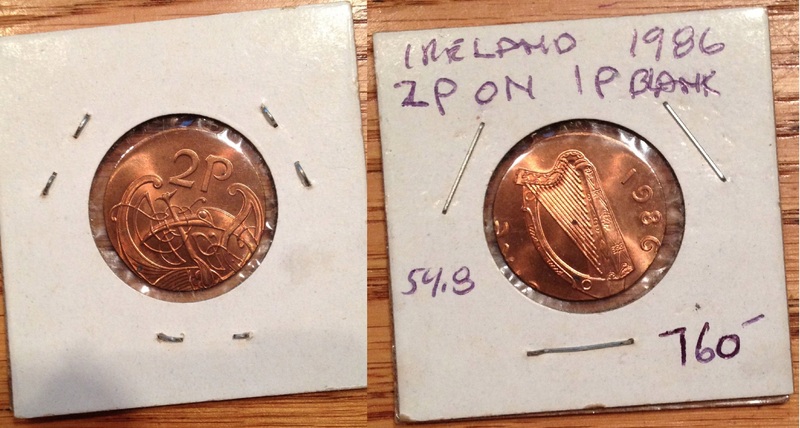 1982 IRELAND, one penny, struck on a scalloped edge , in mint condition. What value would be on something like this ?? I’ve seen them priced between €50 and €120, the higher prices were at the International Coin Fair in the RDS, Dublin. 1) Are the copper-plated steel pennies substantially brighter/shinier than the older bronze ones (they appear that way in photos)? 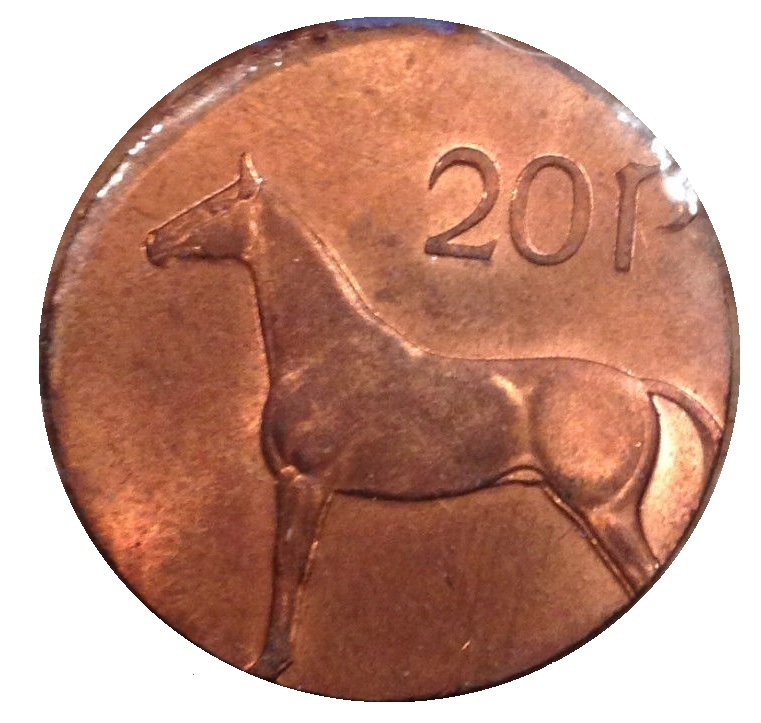 2) Do the copper-plated steel pennies develop a different patina from the older bronze ones? Asking because I don’t have any samples to look at in person, and I’m buying them online to use in an artistic project. Trying to figure out whether to buy all pre-1990 pennies, all post-1990, or a mix. I am familiar with the difference in appearance between USA copper vs. later copper-plated zinc pennies, but I didn’t know if the Irish pennies would be comparable in this sense. Thank you! I can understand your frustration re photo’s – they are dependent on camera type, lighting, etc. (so you cannot rely on them). I’ve never really thought about patina from an artistic viewpoint, but here are my immediate thoughts on this subject. If coins are left exposed to the elements, they develop a patina based on the elements they are exposed to. Air naturally and slowly oxidises with copper to form the commonly seen verdigris (green coloured) on church spires and cupolas. Mix this in with whatever is present in the rainwater, and you can get a slightly different result. However, if the coins are handled by humans, the patina is a mixture of acidic reaction to the sweat on hands + whatever dirt is on those hands. A recent study shows that there are more bacteria (+ more kinds of bacteria) on a circulating coin than on a toilet seat! So, I suppose the answer will depend on whether you are buying bulk mint coins, or bulk used coins. Also, if you are going to clean these coins + if you are going to treat these coins with a chemical to accelerate and/or modify the normal atmospheric oxidation process(es). As a coin dealer, my experience is limited to what collectors do to ‘prevent’ oxidation (due to air/damp/etc). I can say that older coins with a genuine patina (rainbow effect) from being in a coin cabinet can fetch more when they sell. I can also say that coins that are cleaned usually fetch less IF they are sold.